From 10 to 15 July 2016, LERU, Leiden University and Leiden University Medical Center organised the 7th LERU Doctoral Summer School. DTL supported the event. The summer school’s theme was ‘Data Stewardship for Scientific Discovery and Innovation’. Jordy Meekes from Utrecht University was one of the participants. “The summer school made me recognise the importance of open data and data generation: it is fundamental to the quality of research across all academic disciplines and the validity of empirical results”, he says. The League of European Research Universities (LERU) is a prominent advocate for the promotion of basic research at European universities. Every year, its doctoral summer school committee organises a summer school for PhD students of LERU partners. Each LERU partner can nominate two PhD students. 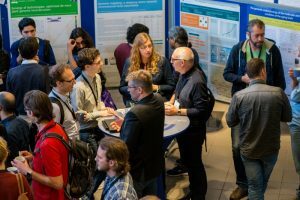 “This year’s 38 candidates were well advanced in their doctoral project and keenly motivated to work on data stewardship”, says Professor Barend Mons, one of the organisers and lecturers of the summer school. Proper data stewardship is swiftly becoming an essential responsibility of experimental and data scientists, if not all researchers. Adequate data stewardship is too complex to be mastered by a single individual and future leading scientists working in an open science environment must be aware of good data stewardship practices and employ specialists in their teams. Consequently, scientists of the future will collectively solve big data related challenges as respectfully collaborating specialists. The 2016 LERU Summer School prepared its participants for this open science future. The summer school week broadly followed the data stewardship cycle, starting with experimental design, followed by capture, curation, integration, licensing, and analysis. Internationally renowned speakers and tutors were teaching and discussing interactively with the students. All students also presented data stewardship ‘do’s and don’ts’. Watch the animation video about LERU. Read Myles Axton’s editorial about the summer school.